(VEN) - Lao Minister of Industry and Commerce Khemmany Pholsena recently told a Ministry of Industry and Trade delegation led by the Editor-in-Chief of the Industry and Trade Review, Nguyen Huu Quy, that the two countries would increase communications to boost economic cooperation. Minister Khemmany Pholsena noted that the Vietnam-Laos Solidarity and Friendship Year 2017 marks the 55th anniversary of bilateral diplomatic relations and the 40th anniversary of the signing of the Vietnam-Laos Friendship and Cooperation Treaty. The good relationship between the two countries, in general, as well as between the Lao Ministry of Industry and Commerce and the Vietnamese Ministry of Industry and Trade, in particular, has been promoted through a variety of communications activities with active contributions of the media. The two countries have maintained tight coordination in implementing their bilateral trade and border trade agreements. Effective cooperation between the Lao Ministry of Industry and Commerce and the Vietnamese Ministry of Industry and Trade, as well as business efforts, have significantly contributed to the expansion of economic cooperation and trade. Vietnam so far has invested nearly US$4 billion in Laos. Last year, bilateral trade reached more than US$800 million. The two countries have upgraded transport facilities to ease bilateral trade and investment. At the two international border crossings of Lao Bao and Densavan, both sides operate single window mechanisms to promote bilateral exports. Editor-in-Chief Nguyen Huu Quy told Minister Khemmany Pholsena that following the guidance of the Vietnamese minister of industry and trade, the Industry and Trade Review communicates news on the policies of the party, the state and the government, as well as the industry and trade sector. The information it disseminates relates to a wide variety of fields, such as administrative reform, business environment improvement, investment attraction, trade development, import, export, industrial production, market surveillance, smuggling prevention, environmental protection, food safety, and international economic integration. The Industry and Trade Review has also provided specific news and information about the comprehensive cooperation between the two countries and has maintained technical exchanges with the Lao Economic Daily newspaper. 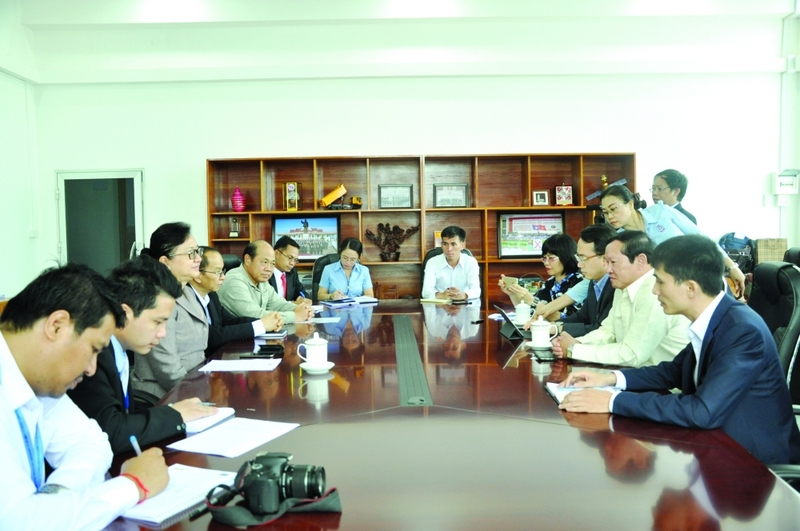 Editor-in-Chief Nguyen Huu Quy expressed his hope that Minister Khemmany Pholsena would continue to support the two organs as a means to implement and boost cooperation agreements that have been signed between the Vietnamese Ministry of Industry and Trade and the Lao Ministry of Industry and Commerce. The two ministries recently launched an economic and trade cooperation website. Minister Khemmany Pholsena said she believes this information channel will contribute significantly to promoting economic cooperation. A major trade promotion event, the Vietnam-Laos Business Forum, is scheduled to take place in early September, following the success of the Vietnam-Laos Trade Fair in late June.